A block of forms, partially used up. Bent advertised bills of lading from as early as Aug. 1816. This example dates from the 1830s, probably from around the time Bent resumed printing in 1832. In the Colonist 6 July 1832 Bent advised he had received some new type including some neat and beautiful English script (used the for heading on this bill) and also that he could print bank cheques, bills of lading etc. in large and small script, antique and old English open, equal in neatness to copperplate and at moderate charges. Possibly printed by Bent as it uses same decorative strip as previous item. In a miscellaneous collection of early Hobart billheads, shipping notices and promissory notes, 1830-1890 collected by Crowther. 1 sheet; 40 x 50 cm. printed on one half of the sheet and intended to be folded in half. Bent advertised powers of attorney for sale from as early as Aug. 1816. This unused example was probably printed between 1832 and 1838. A Dialogue on Baptism. By E. Mote. The only known copy of this imprint appears to have been dis-bound from a collection and has no t.p or cover. Title is given at head of text on p. . No newspaper announcement of publication found. Ferguson assigns a date ca. 1835. 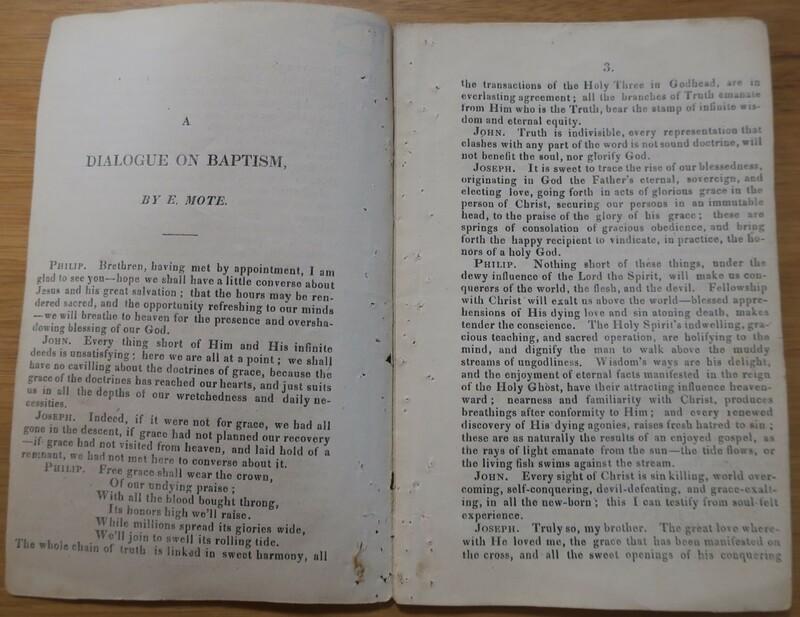 Possibly a reprint of a tract by Baptist minister Edward Mote, 1797-1874, who compiled Hymns of Praise, and published a number of religious pamphlets in England, but no original version has been identified. There is no evidence Mote ever came to Australia.